As you know by now, we love to celebrate birthdays with a fabulous meal, and so Lola’s birthday celebration this past week was no different. 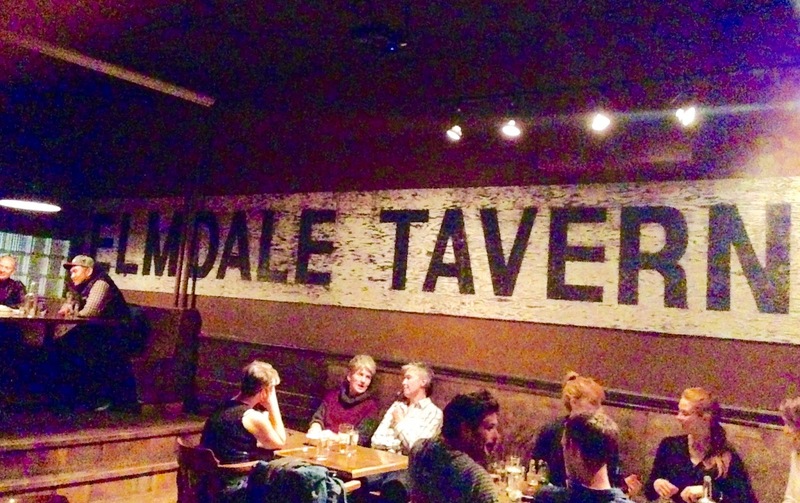 We headed to the Elmdale Oyster House and Tavern in the burgeoning Hintonburg neighbourhood. Open since 1934, this 81-year old Hintonburg fixture has seen several ownership changes, the latest of which occurred in 2013 when it was taken over by the Whalesbone Oyster House and remade as a seafood restaurant. Since its reinvention, we passed by this restaurant on a few occasions, although it never made it on our ‘must-try’ list. 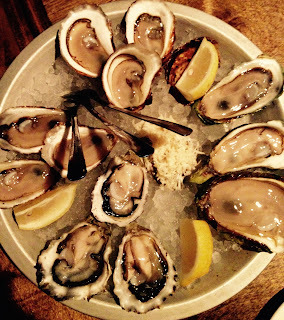 But as fanatic lovers of oysters, Lola finally recommended that we check it out, and so we did! The restaurant continues to rock the familiar, warm atmosphere of the former tavern, with its minimalist, rustic decor, dim lighting and friendly staff. 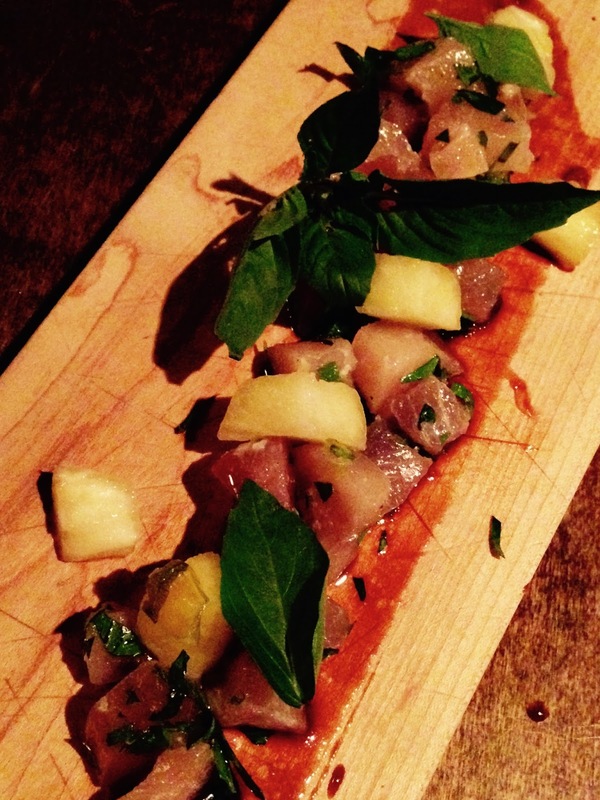 However, the menu has completely transformed, with a focus on top-notch sustainable seafood. When we first arrived, we were warmly greeted by our jovial waiter, who we quickly came to call ‘Charlie Day’, for both his sense of humour and uncanny resemblance to the actor. Without delay, he brought us some cold beverages, and then helped guide us through the menu, which consisted of various fresh seafood dishes, served raw, cured, smoked or fried, and other mouth-watering delicacies. We decided to order a bunch of smaller plates to share, so that we could experience as much of this delicious food as possible! 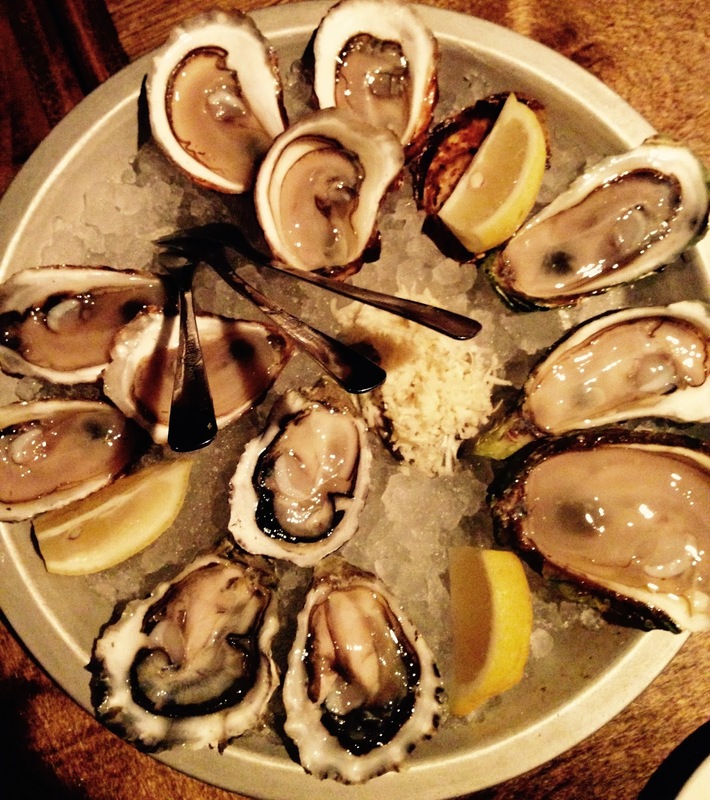 Of course, we had to start with the Oysters on the Half Shell (12 oysters for $35). A tray of pristine, assorted oysters was served with a slew of sauces and garnishes, including fresh horseradish, mignonette and cocktail sauce, and array of other local hot sauces. The oysters were fresh and of top quality. Served alongside the oysters was the house bread and butter, which was totally addictive...whipped in-house burnt butter served with first-class sourdough bread. It was truly delicious! But we had to refrain from asking for a refill, as we had a lot more on the menu to taste! 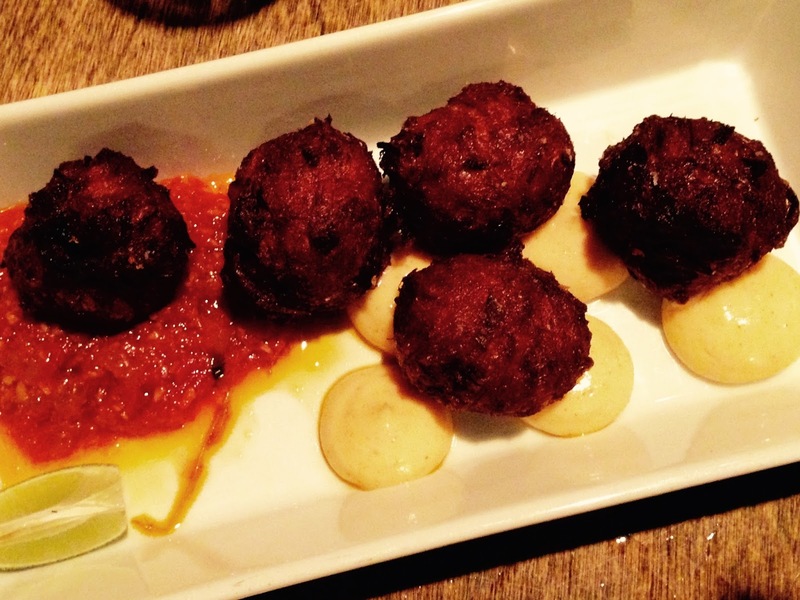 Next up were the Saltfish Fritters ($16), which we were told were a must-try. Five fried fish battered balls were served with tomato sofrito and other delectable, but unknown sauces. This dish was completely on point and certainly did not miss the mark. We quickly understood why this was a crowd pleaser! 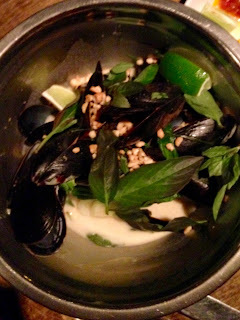 After that, we went with the Albacore Tuna Crudo topped with pickled pineapple, pork rind, sweet soy and Thai basil ($21), as well as the Mussels, which were served in a curry sauce consisting of coconut milk, kaffir lime, peanut and basil ($17). The tuna was succulent and tasty, as were the mussels. The combination of flavours in both dishes was bang on. 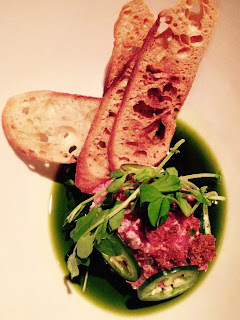 We decided to finish off the meal with the Angus Beef Tartar ($18), which the waiter raved was the best in town. It was served in a miso mayo with shallots, herb and egg yolks, accompanied by a few pieces of crostini (which we obviously got topped up). Again our waiter did not disappoint. Hands down, this was the best Beef Tartar that we have ever had. To sum it up, it was heaven in our mouths. The menu also had three tantalizing dessert options, however, by that point, we were way too full to indulge. So we decided to call it a night. Overall, this was one of my favourite meals I’ve had in a very long time. The food completely surpassed my expectations. The only real disappointment of the night was that they ran out of the Scallop Ceviche. But this just means that we have an excuse to return! Next time, we will coincide our visit with one of their regular live music performances, whether it be DJ spun dance music, duelling pianos or a local artist. Hours: Monday-Tuesday 5 p.m. to 11 p.m., Wednesday & Sunday 11:30 a.m. to 11 p.m., Thursday to Saturday 11:30 a.m. to 2 a.m.